It’s finally summer, and that means one thing: ice cream season. For the average person that means taking family and friends to go get some sort of frozen treat after dinner. For workers at The Stand, however, it is an entirely different playing field. Ice cream season means crazy, hectic nights where you come home with caramel on your legs and chocolate in your hair, but it’s all for the love of The Stand. The Stand opened 11 years ago and since then, has stolen the hearts of the Fort Wayne community. 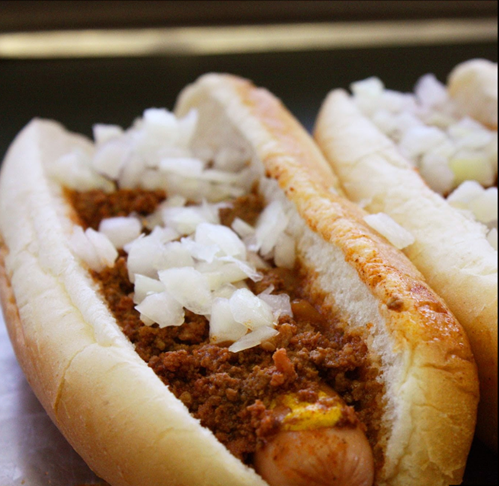 They are known for their homemade coney sauce, freshly steamed buns and hand cut onions that could make any coney lover’s mouth water. They are also the home of the infamous Waynedale dog, which has their savory coney sauce and homemade coleslaw, making coleslaw haters of Fort Wayne fall in love. The Stand has ranked in Foursquare’s “The 15 Best Places for Coleslaw in Fort Wayne”— making the Waynedale dog that much more delectable. And what better way to wash down those coney dogs than with a Flavor Burst ice cream cone? These curvaceous cones are centered with rich, creamy vanilla ice cream wrapped with flavored syrups that include the ever popular Blue Goo, Butter Pecan, and Strawberry. The Stand is one of the only companies in Fort Wayne that has a Flavor Burst machine. Being a Stand Fan is coming to The Stand to enjoy warm summer nights with your family, where baseball teams come after games and children's eyes light up when they see their ice cream coming. So, head on over to Waynedale and find out the true meaning of what a Stand Fan is! This year also marks the 11th anniversary of The Stand, and was recently featured in the Waynedale News.